Norman, a French sheepdog that can ride a scooter and bicycle like a human, has been able to get urgent cancer treatment thanks to donations from his fans. Norman the Scooter Dog, who has set Guinness World Records and once showed off his moves on TODAY, has been able to get life-saving cancer treatment thanks to the generosity of strangers. 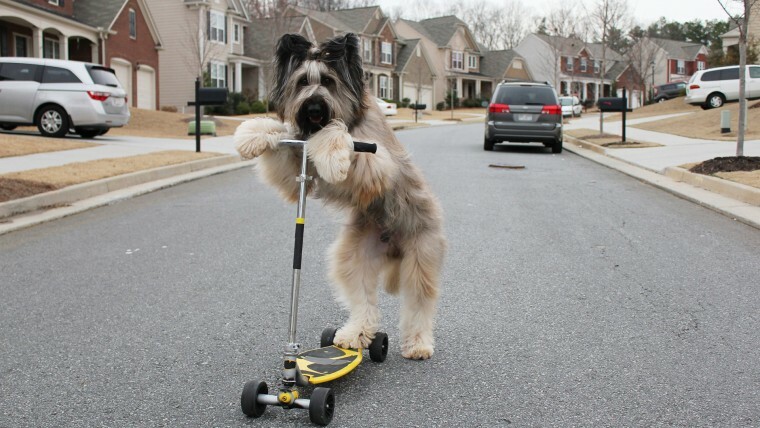 Norman, a 7-year-old Briard (French sheepdog), has captivated people by his ability to ride a scooter and a bicycle like a human, which he first showed off on "The Late Show With David Letterman" in 2011. The lovable pooch was diagnosed in June with Stage 4 lymphoma after owner Karen Cobb noticed swollen lymph nodes on his chin and one of his rear legs. Lymphoma in dogs can result in death in just two to eight weeks in some cases, making it urgent that Norman get treated immediately with chemotherapy and a bone marrow transplant, according to a GoFundMe page set up to raise money for his treatment. "Norman has so many more years of joy to give,'' the page reads. "This dog loves life and lives to make others happy. It is hard to imagine not doing everything humanly possible to save his life." The dog appeared on TODAY in 2013 when he rode a scooter on Rockefeller Plaza. A few months earlier, he has set a Guinness World Record as the fastest dog on a scooter when he traveled 100 feet in 20 seconds at a charity event in Georgia. Norman was able to be treated immediately thanks to more than $23,000 being raised to pay for his cancer treatment protocol. The Perseus Foundation, an animal cancer charity, has also agreed to match donations of up to $10,000 to pay for Norman's care. He underwent chemotherapy near the family's home in Canton, Georgia, before traveling to California on Sept. 28 for a bone marrow transplant. Norman is being treated by Dr. John Chretin at VCA West Los Angeles Animal Hospital, according to the Facebook page updating his progress. Norman has required daily platelet infusions that cost $2,000 each with a goal of reaching a platelet count of 10,000 that he has been progressing toward. Dogs of his breed typically live to be 12-14 years old, so the hope is that Norman can get back on his scooter in no time to keep wowing crowds. "Still feeling great,'' said a Facebook update from last week. "I’m playing and eating well too! They are still seeing some new platelets that look like my own, not the transfused. This is a good sign. Keep hoping!"